This was a complicated model, and I really appreciate the stl parts all separated out by color. Also the fact that the person did this all in SCAD is amazing! The only problem I had was the joints. Most joints had to have the bumps filed down (I found out after breaking his hip). Then the shoulder joints were too loose and had to be heated with a heat gun and spread wider. This Voltron is not 100% true to series (eg no star belt and so on) but with a little paint he looks plenty close enough! Thanks! Yeah, I actually had the same issues (loose shoulders, tight hips) with my model. 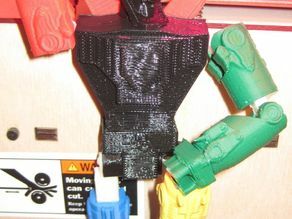 But, I ran out of the necessary colored plastic and wasn't able to reprint it. You did an amazing job with the paint!